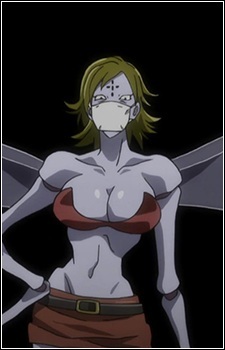 Mosquito is one of the Chimera Ant Soldiers in Yunju's division. Mosquito is a Chimera Ant that resembles a humanoid mosquito with mannequin-like articulations like most of the Chimera Ants. She has insect-like wings, arms long as long as her legs and insect-like hands and feet. She has short dirty blonde hair, large breasts and wears face mask to hide her mouth's sting and a short skirt to hide her extendable tail from her enemies.